Are Lego actually making a gigantic SHIELD Helicarrier? Prepare your Wallets, Lego fans: there's been a flurry of rumours over the weekend that Lego might be planning on bringing SHIELD's floating HQ to their range of Marvel toys next year - and not just as a normal set, but a humongous (and pricey) display model. Header Image Credit: The incredible Helicarrier model by Yosub Joo currently running on the crowd sourced project site Lego Ideas - we've featured it before! As Groove Bricks point out, the model in the 'G' of 'Design' certainly draws similarities to the front shape of a Helicarrier - including the little spikes that jut out the nose - and there's even what looks like a little Quinjet floating above it for scale. Before you get really excited though, be warned - the rumour floating around this set not only pegs it as being released in March of next year, but also at a whopping $350, making the rumoured model one of the priciest sets Lego have sold. That said, man. 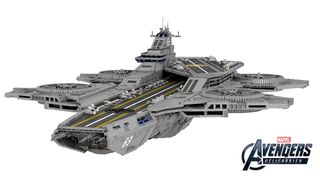 $350 of Helicarrier lego goodness? I can hear my wallet shrieking lamentations already.